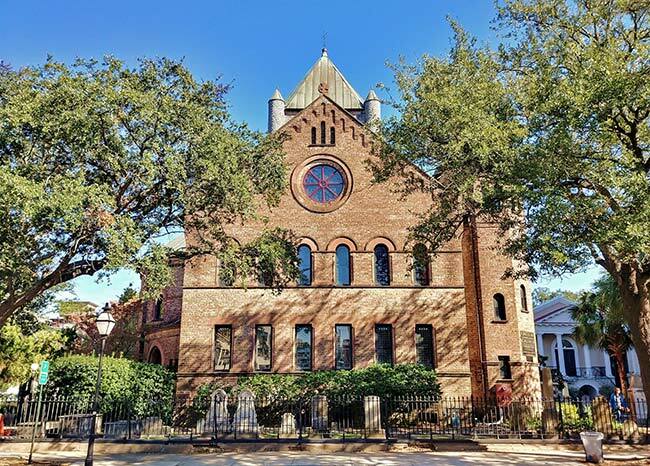 The Independent or Circular Congregational Church – originally called the White Meeting House – was founded around 1681 by a group of Charleston‘s earliest colonists. Its congregation comprised the city’s first non-Anglican church. Because members did not adhere to the Church of England, they were considered “dissenters” and forbidden to label their place of worship a church – only a meeting house. The group included English Congregationalists, French Huguenots, and Scottish Presbyterians. 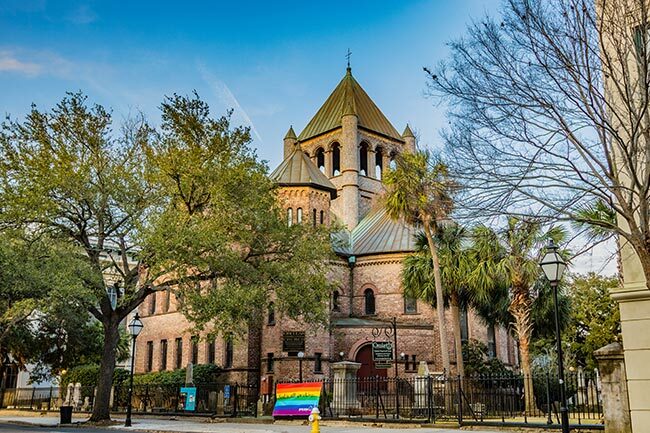 The road leading to their meeting house was first known as Meeting House Street and is now known simply as Meeting Street, which remains one of downtown Charleston’s primary arteries. The congregation also included African-Americans, both free and enslaved, who worshiped here until forming their own church, Plymouth Congregational Church, in 1867. In 1804, renowned architect Robert Mills designed a circular building made of bricks to replace the old wooden meeting house. 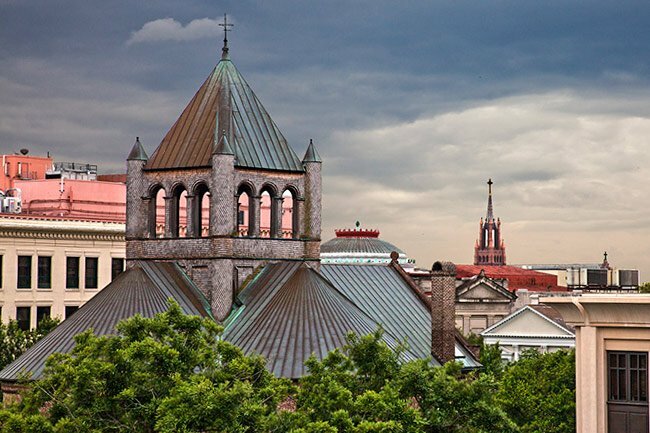 That building was destroyed by a fire at the beginning of the Civil War, but in 1890 the bricks from the ruins were used to create the present church. The churchyard at Circular Congregational is the oldest in the city. 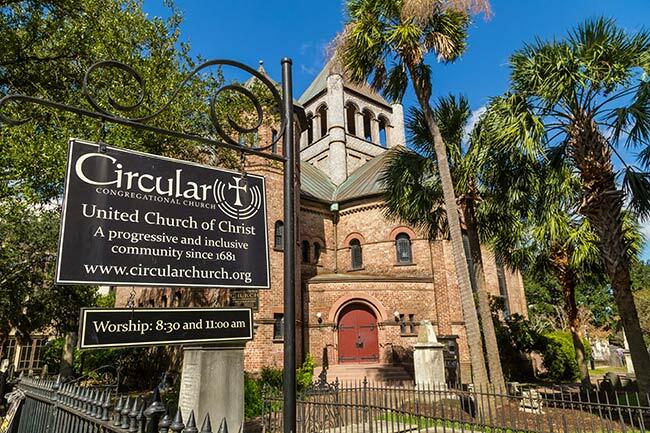 Built circa 1892 in the Richardsonian Romanesque style, the Circular Congregational Church is not truly circular as its name implies, but a more complex form like a clover leaf or “club” in a deck of cards. This form has four parts, three of which are semi-circular and the fourth rectangular. The clover leaf form contains the high, main auditorium. The rectangular “stem” is divided horizontally into two stories. The lower part is a rectangular meeting room and the upper part is a balcony overlooking the auditorium. The balcony is reached by a winding stair in an octagonal tower which is expressed on the exterior of the building. This is the third church to be built on these grounds. 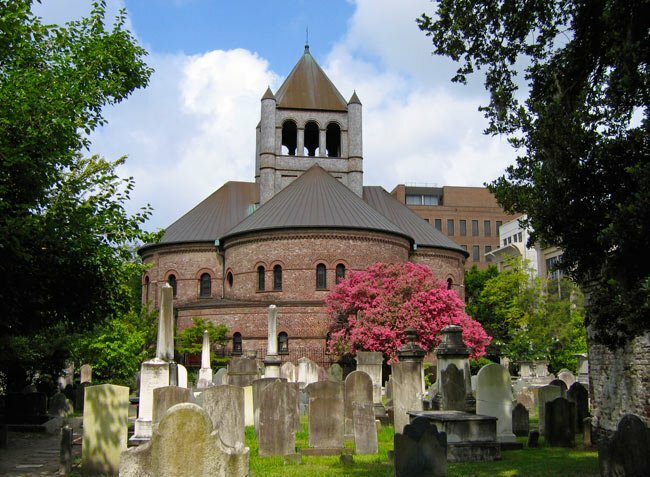 The word “circular” in the name of the church comes from an earlier building on the site by Robert Mills. The Parish House is a good example of a Greek Revival Temple form with one high story over a lower open arcade. Tetrastyle Tuscan columns support the Doric style entablature and pediment. Church services were held in the Parish House during the interim between the building of the first and second church. The image above shows the Circular Congregational as it stood in April of 1865, at the close of the Civil War. The church, the congregation’s second on this site, was designed by renowned architect Robert Mills. 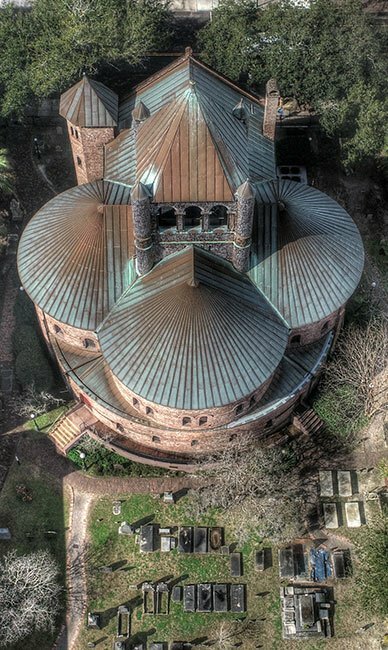 Seeing the church from this vantage, without its roof, allows us to fully appreciate its original (and namesake) circular design. The building was rebuilt from these ruins, between 1890 and 1892, in a cloverleaf shape. This photograph was taken from the top of the Mills House by George N. Barnard. 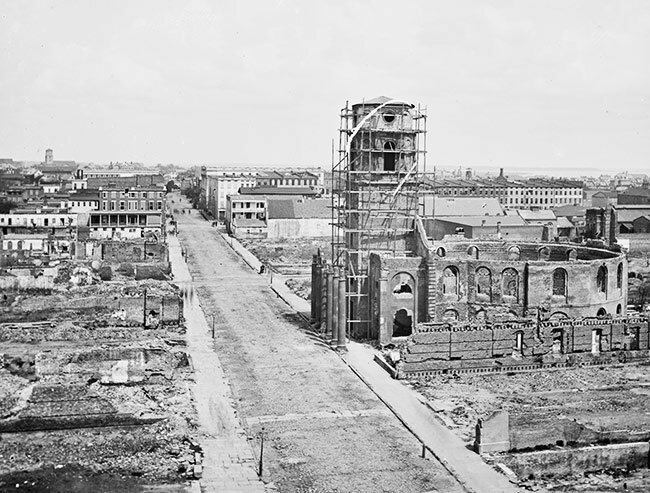 In the bottom right of the photo, adjacent to Circular Church, you can also see the ruins of Secession Hall, which was not rebuilt. The photograph above was taken by Dr. F.F. Sams, an esteemed doctor and photographer in the Charleston area who used a homemade camera to capture images of the Lowcountry. This picture was contributed by his grandson and namesake, Franklin Sams. Much of Dr. Sams work can be seen in the archives of the Charleston Museum. 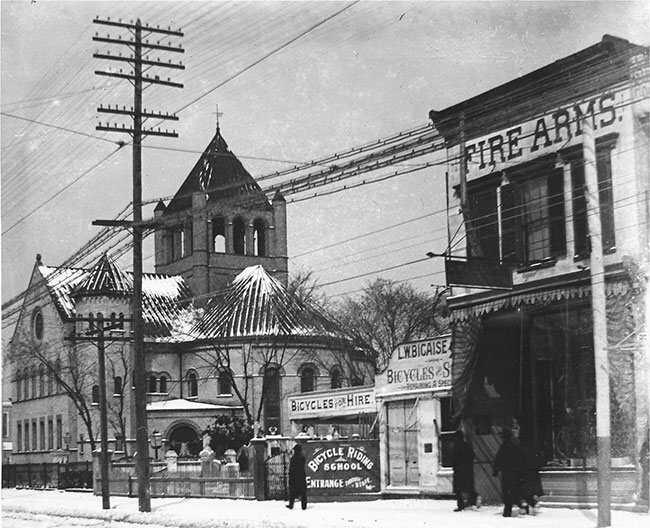 The photo shows the Circular Congregational Church as it appeared during a snowstorm in 1903.